It is a pleasure to walk into the studio and see a number of works in progress. Working on multiple canvases greatly reduces the pressure of trying to make an individual oil come together in some perfect way. Instead of rushing and stressing, the many works benefit from an extended time of contemplation and experimentation. 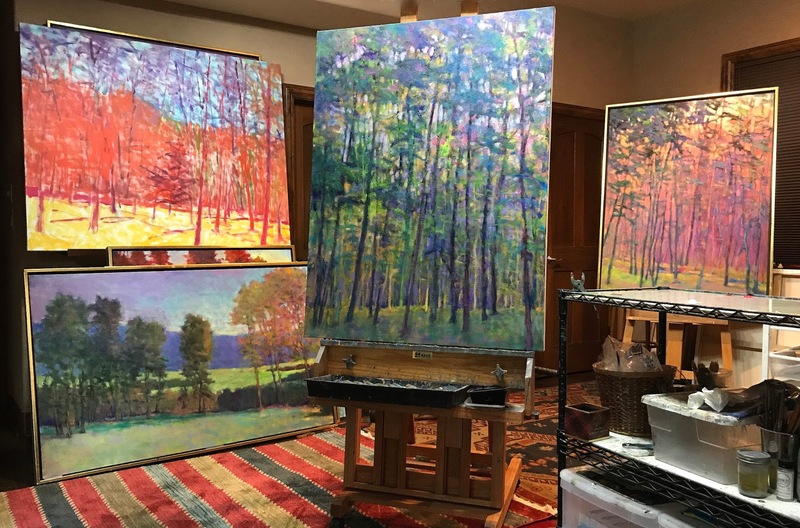 Two of these works, the 3 x 5 foot on the easel and on the one on the floor are new starts, painted directly over an older idea that wasn't working. In both cases, these new starts are quite different from the underlaying image and I felt free to work right over an idea that was a struggle. Having a lot of canvases in play is liberating... everything is up for change, sometimes radically. No single canvas or section of the oil is precious. The upper left canvas is 4 x 5 foot, a new start from last week and the oil on the right was started as a demo in my art class a couple of months ago. These canvases proceed in a steady but non-linear way and everything is up for grabs. All is in pursuit of the best possible outcome, a compelling work of art that is successful on a number of levels. Along the way, many experiments in color, light, contrasts, etc are tried out. It appears that a lot of mistakes are being made and sometimes that is the case, but this is really an efficient way to take these works into new and unpredictable territory. There is always intrigue in the studio with the paintings communicating their present needs and dreams of greater things. Strategies will be pursued and because this process welcomes surprises, thrills will often result. The picture you added are so artistic. You are so talented, Keep going and keep sharing as i would love to see more of your posts.